iSatori has a slew of new products they are releasing, and the first is an all new protein powder combining whey protein and Bio-Gro! Just like us, many supplement companies take it easy around the holidays, enjoying the fruits of the previous year’s hard work. iSatori is have none of that! They’ve got a slew of new products in development and have slowly been releasing them during this otherwise quiet time of year around the industry. We’ll slowly be rolling these out over the coming days and weeks as more information becomes available, but today we’ve got a good one for you! 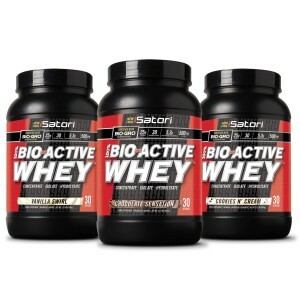 iSatori has released a brand new protein powder named 100% Bio-Active Whey, that combines the power of whey protein with iSatori’s patented Bio-Gro™ Technology of Bio-Active Peptides. Bio-Active Whey combines 3 forms of Whey protein along with iSatori’s patented Bio-Gro Bio-Active Peptides to create a truly unique protein packed combination. Bio-Active Whey, as you may have guessed, is a straight blend of whey that uses a mixture of Whey Protein Concentrate (WPC), Whey Protein Isolate (WPI), and Whey Protein Hydrolysate that combine to yield a total of 25g of high quality protein. WPC contains anywhere from 35-80% protein, with the rest consisting of fats and carbs (from lactose / milk sugars) and perhaps a few other things like moisture. WPI is a more pure form of whey that contains at least 90% protein due to having virtually all the carbs and fat removed. Lastly, we have Whey Protein Hydrolysate, which are the biggest “refinement” of whey. Hydrolysates are “predigested” or hydrolyzed whey protein, by means of enzymes that yield a protein with the fastest rate of digestion of all whey protein powders. This creates a flood of amino acids that’s shuttled into the bloodstream faster than WPC or regular WPI. The advantages to using the bio-active peptides is that they should enhance recovery, strength, and lean body mass by amplifying the body’s natural protein synthesis process. However, the research surrounding Bio-Gro is far from conclusive in our opinion. Bio-Gro is based upon colostrum, which there is a lot of research in terms of lean mass gains – but typically when taken in higher doses. [2,3,4,5,6] We’re very high on colostrum – but the question has always been how much better Bio-Gro is than colostrum itself, and at what dose. iSatori is finally releasing much of their research around it[7,8] showing that it typically enables you to increase total training volume through improved recovery, at the very least. What’s nice about 100% Bio-Whey, though, is that you’ll get to try and see if Bio-Gro really lives up to its billing since it’s included right into a competitively priced protein supplement. If you see gains over your typical protein shake, and keep everything else the same, then Bio-Gro (and 100% Bio-Whey) is clearly for you! Rounding out the rest of the ingredients is Xanthan Gum to help thicken up the powder when mixed yielding a thicker texture and better “mouth feel.” To flavor the powder, 100% uses Sucralose as its sole sweetener as well as salt natural flavors to complete the rather minimalist ingredient list. 100% Bio-Whey comes in 2.31-lb tubs that yield 30 servings/container. For flavors, you’ll be able to choose from: Chocolate Sensation, Vanilla Swirl and Cookies N’ Cream to start. iSatori has said that it will retail between $29.99 and $34.99 depending on where you look, which makes it a top value vs some of the competition out there. iSatori’s new line of products is off to a promising start with the debut of their new protein powder. If you’ve never tried Bio-Gro in any of the other products iSatori offers, this may be a good opportunity to see what it has to offer without having to shell out additional dollars on Bio-Gro™ alone. To be completely honest, we’re surprised it took iSatori this long to make this. For a company that doesn’t have a whey protein product, and given the success of Bio-Gro over the past couple of years, it only makes sense. As long as it remains competitively priced, this offers a great 2-for-1 opportunity to get some high quality protein and a chance to try Bio-Gro for yourself. We have high hopes for the rest of iSatori’s new products as they continue to roll out. Make sure to stay tuned for all news that breaks on the latest releases, and make sure to sign up for alerts below. No Comments | Posted in New Products, Supplement News | Tagged Bio-Gro, Bioactive Peptides, Colostrum, iSatori, Protein, Protein Powder, Whey Protein, Whey Protein Concentrate, Whey Protein Hydrolysate, Whey Protein Isolate. Hofman Z, Smeets R, Verlaan G, Lugt R v d, Verstappen PA. The effect of bovine colostrum supplementation on exercise performance in elite field hockey players. Int J Sport Nutr Exerc Metab. 2002;12(4):461-469. Brinkworth GD, Buckley JD, Slavotinek JP, Kurmis AP. Effect of bovine colostrum supplementation on the composition of resistance trained and untrained limbs in healthy young men. Eur J Appl Physiol. 2004;91(1):53-60. doi:10.1007/s00421-003-0944-x. Coombes JS, Conacher M, Austen SK, Marshall PA. Dose effects of oral bovine colostrum on physical work capacity in cyclists. Med Sci Sports Exerc. 2002;34(7):1184-1188. Antonio J, Sanders MS, Van Gammeren D. The effects of bovine colostrum supplementation on body composition and exercise performance in active men and women. Nutrition. 2001;17(3):243-247. Lund P, Sangild PT, Aunsholt L, et al. Randomised controlled trial of colostrum to improve intestinal function in patients with short bowel syndrome. Eur J Clin Nutr. 2012;66(9):1059-1065. doi:10.1038/ejcn.2012.93. Boone CH, Beyer KS, Stout JR, Hoffman JR, Fragala MS, Fukuda DH. Bio-active peptides (BiogroTM) supplementation improves work capacity during short-term resistance exercise in men. J Int Soc Sports Nutr. 2014;11(Suppl 1):P26. doi:10.1186/1550-2783-11-S1-P26. Willoughby DS. Bio-Active Peptides [BAP’s] Their Role in Protein Synthesis and Human Performance Enhancement Related to Recovery and Lean Body Mass Gains. iSatori, Inc.